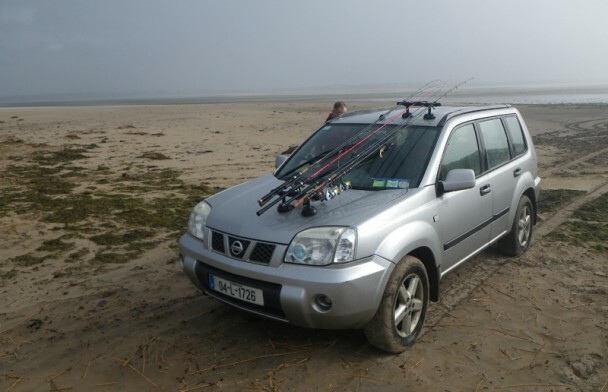 Fishing trips seldom turn out the way you imagine they will – I think we all accept that. 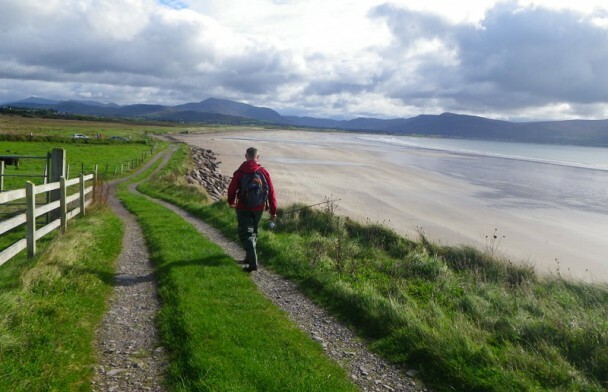 There was a moment, however, towards the end of the first day of this bass fishing trip to Kerry, Ireland, when an uncomfortable feeling of deja vu was settling over me. 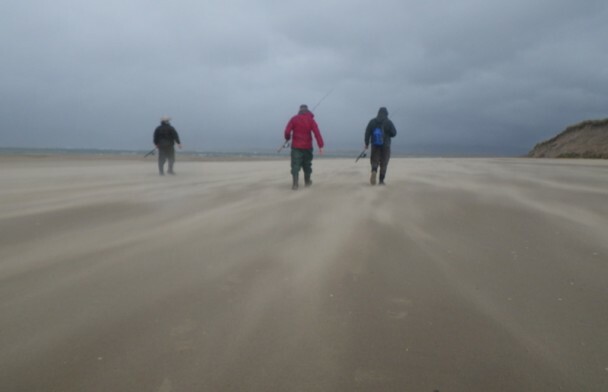 My last visit to the Emerald Isle in 2012 resulted in a week of horizontal rain, near-unfishable water and precious few fish. As we trudged back to the car after another bass-free session on Monday evening, I was beginning to think we were in for more of the same – and that was hard to accept. Particularly hard given that we were only here for three days and Martin, my fishing companion, had never caught a bass before. Time was already against us. Fortunately, Monday’s forecast promised something more favourable – light westerly winds, minimal chance of rain, balmy temperatures (16°C in mid-October!) and the chance to fish some of the more productive marks we weren’t able to reach the previous day. As any bass fisherman who’s spent time here will tell you, things can change pretty quickly in Ireland, so we remained positive. 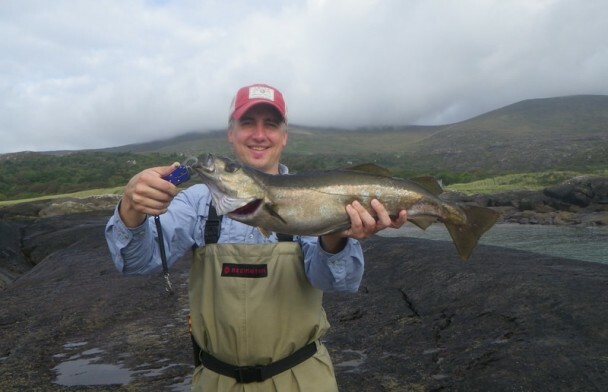 Day two started slowly again – first stop was a small estuary that spills out into a beach in the Waterville area, where the resulting rip provides an ideal ambush point for hungry bass looking for food swept out into the surf. Our guide, the mighty John Quinlan of Thatch Cottage Ireland, looked happy with the conditions and the spot was about as bassy as a mark can be. But despite four of us working the shore, our efforts came to nought. With that, we moved around the bay to a set of rocks to target pollock. First cast over the kelp and a pollock exploded out of the water like an exocet with such gusto that it completely missed my plug swimming happily just beneath the surface, sailed clean past it, out of the water and back into the water. Second cast and the fish was on – hitting the lure in almost exactly the same spot. A minute or two later and a bright, bronze-flanked beauty lay glistening on the rocks in the Kerry sunshine. Things were looking up. For the next hour or so we nailed plenty of pollock, most of the fish coming to small soft plastics fished slowly in the gulleys between the rocks. They mightn’t have been bass, but they were welcome nonetheless – sometimes you just have to get a bend in the rod. 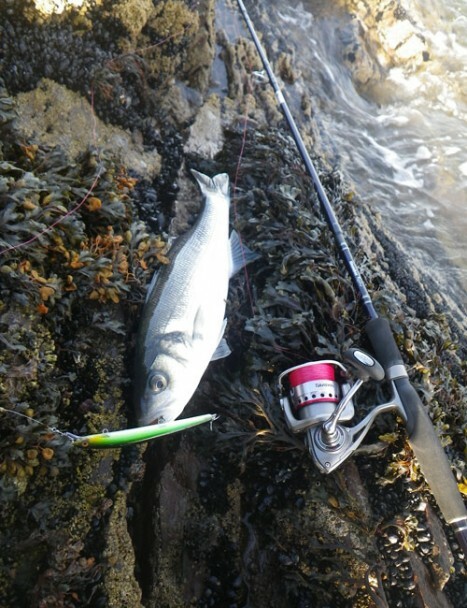 Soon enough the tide slackened and the sport went with it, so we upped sticks, grabbed some lunch and made our way to the next spot – one of John’s favoured bass marks. Funny isn’t it – you might have struck out time and time again, but you always feel supremely confident when you hit a new mark. Given the time we spend out on the water, it’s hard to maintain 100% concentration on the mechanics of what you’re doing at all times – you’ll go into autopilot as you retrieve a lure, and find yourself looking around for diving birds or sizing up the next rocky outcrop to fish from. So often it’s times like when fish hit. Not this time though – having decided to try a slightly slower retrieve, I was fully immersed in the process of working the lure when the rod tip buckled round and the drag came to life. John said he’d never taken a pollock from this spot before, so I was confident it would be the target species. It was probably no more than a minute, but it seemed to take an age to get the fish’s head up to confirm its identity. Yet finally, there it was – not a monster by any standards, but exquisite nonetheless. 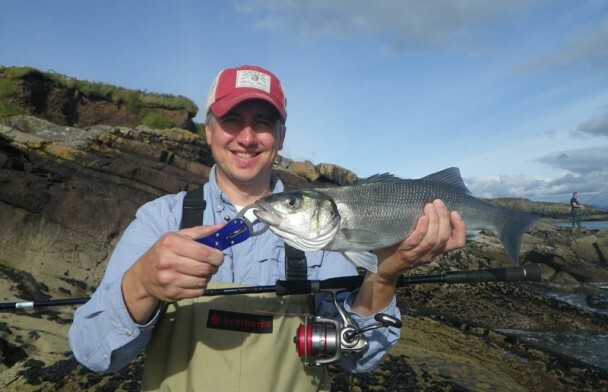 3lb or so of wild, spiky, silver – a Kerry bass. 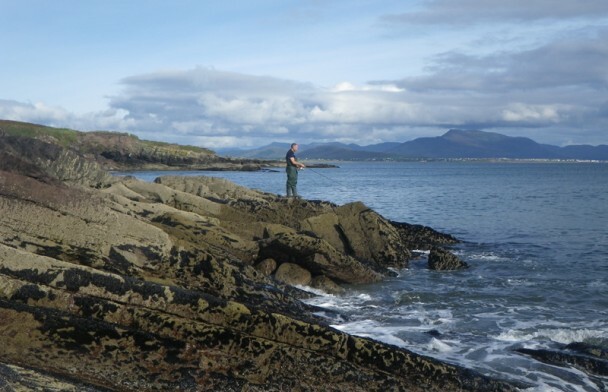 After fishing on for a bit with no further action, we moved on to a productive stretch of rocks just round the bay from Waterville – a fingered formation that would allow us to spread out and cover an expanse of water, then signal to the others if we found the fish. The water clarity wasn’t ideal and I could tell John wasn’t completely happy, but we decided to chance it. 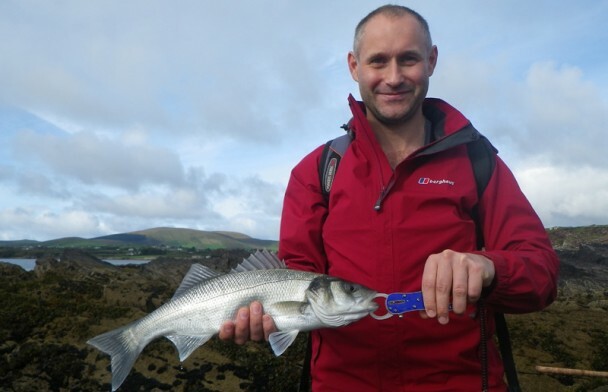 I’m glad we did – half an hour later, the Rapala got nailed again and a sprightly 2lb bass came to hand. At this moment there was only one thing on my mind – getting Martin his first bass. I signalled to the others and after a few minutes’ clambering over the rocks we were fishing side by side, wind to our backs, Kerry sun shining and a palpable sense of optimism in the air. Then finally, it happened – Martin’s rod hooped over and the fish was on – again, not a monster, but it was a fish I doubt he’ll ever forget. I sometimes struggle to convey to people exactly what it is about fishing that I find so all-consuming. But I have to tell you, there’s little explanation required at a time like this. With the hills of Kerry rolling away into the background, a vast and beautiful estuary stretching out ahead of us and there, somewhere in the middle of it all, 3lb of bass glistening under the Irish sun, it all made sense. The following morning, having said our goodbyes to John, Lynn and the other guests at Thatch Cottage, we headed back to the same spot for our final session before reluctantly driving to the airport. The rookie clearly had a taste for it by now – I finished the morning without a fish, but the newest member of the bass addicts society chalked up another two. His final bass, a chunky little scrapper of about 3.5 or 4lb, was undoubtedly his biggest so far, but I doubt it’s the one he’ll remember most. 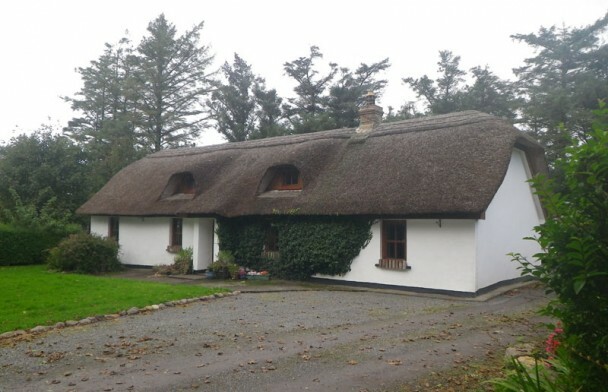 Thatch Cottage Ireland. 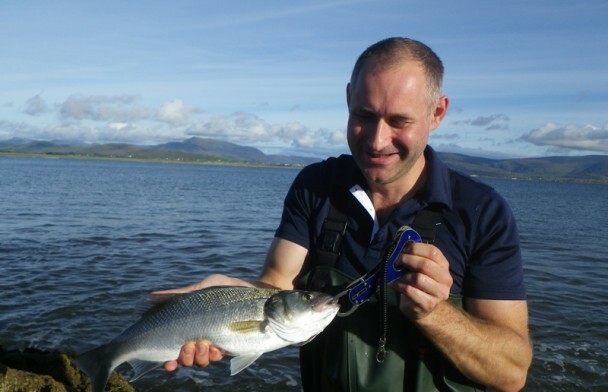 Run by John and Lynn Quinlan, this place in Cahersiveen, Kerry, is the place for bass fishermen. There are plenty of B&Bs in the area, but staying here gives you the chance to fish with one of the area’s finest guides. You’ll get three (hearty) meals a day, use of fishing equipment should you need it and the chance to meet other like-minded bass junkies and trade stories over a drink or two. Click here for details. I’ve tried not to be specific about locations – out of respect for John who was thoroughly generous with knowledge, but who wouldn’t want the information distributed so freely. That being said, I couldn’t recall half of the places even if I wanted to – I struggled to keep up with where we were most of the time. If you’re heading to this area for the first time, you’ll save a lot of time if you book some time with John. All the bass fell to Rapala MaxRaps (13cm, 15g version) and Feed Shallows. For pollock, we fished a range of soft plastics. No need to be too fussy – just make sure you’ve got something weedless for the snaggy areas. The one area in which I wasn’t sufficiently prepared was soft plastics suitable for the estuary systems. Where these bodies of water flow out to the sea, the tidal rips are fierce and you’ll need jig heads of at least 20g to get down to the fish, along with larger plastics such as Giant Xlayers or similar. Make sure you pack a few Bass Bullets as well – you never know when you’ll need to really get out into the surf.